I feel like it has been so long since I have last posted and so much has happened! 1. 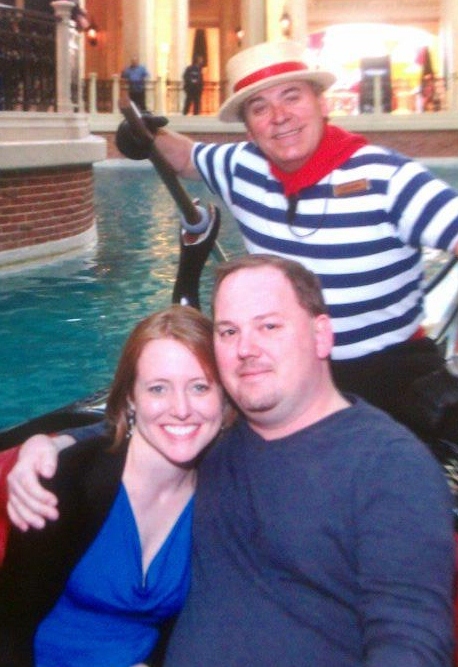 My hubs took me to Las Vegas for my 30th birthday! I know...you can be jealous! I had never been there before and it was such a great way to spend such a big birthday! 2. I turned the big 3-0! That in itself is a huge accomplishment (and a bit scary). 3. I sold my 100th product on TPT! Woo Hoo!! I wasn't sure if it would even take off and look at me now. 4. I now have over 2,000 page views on my blog. So cool! 5. I am very close to 15 followers! I am hoping that I reach 20 soon so that I can finally do a give away! 6. I gave my blog a make-over and created a button for it. I am loving the new look...definitely is more "me." Feel free to add my button to your blog! 7. I am a bit intimidated since my last faculty meeting... we learned about new testing questions on the state tests (we are not common core in Virginia) and they are intense! I don't even teach a testing year and I am nervous. I feel like I have to do so much more and I am not sure how my little firsties are going to handle it all! Most of the questions are now open ended; some have more than one correct answer and the kids have to get all of the correct answers or the entire question is wrong; for many of the questions, the kids have to utilize many different skills and strategies just to get one answer. So, as a result, I am in the process of creating some new activities (especially for math) that will challenge my kids a little more. In the meantime....I have my newest decoding strategy, Skippy the Frog, and an updated version of Chunky Monkey! Yay! Skippy the Frog reminds students that if they are unsure of a word, they can skip it and keep reading until they get to a period. Then they can use their context clues to infer what the word is. 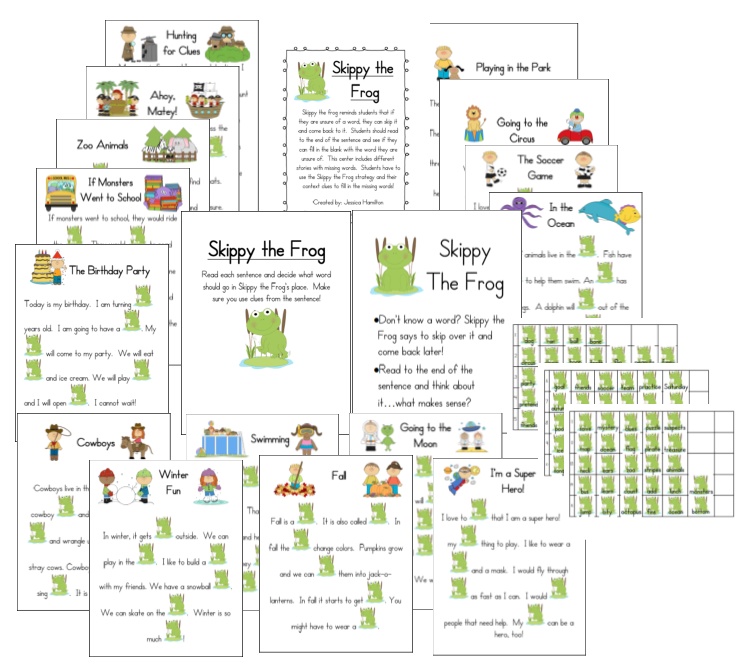 This activity is a cloze reading activity that has been turned into a fun literacy center. In this center, there are many different stories with missing words. Skippy the Frog is where the words should be. Students have to match up the words to the right place in the story by using their context clues. You can get a copy of this poster and activity set here! I also updated my Chunky Monkey strategy with some new graphics. The old one had some fuzzy graphics and really just were not that cute. This one is definitely improved! All of the activities are the same though. Chunky Monkey reminds kids to chunk their words into chunks of sounds and to find smaller words inside of bigger words. 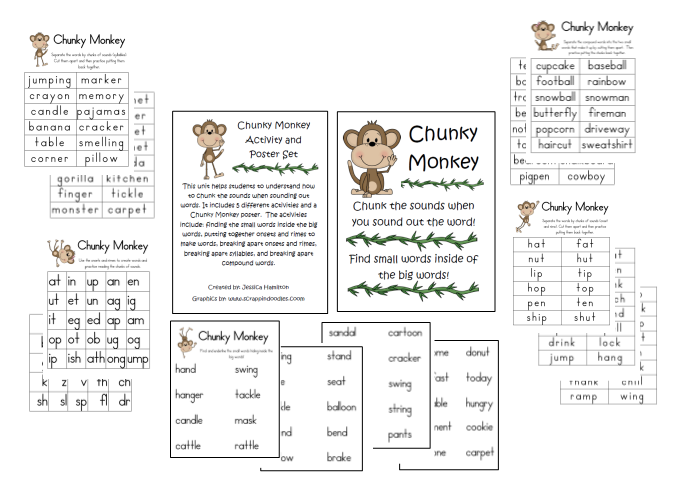 This set includes a Chunky Monkey poster and many activities in which kids can practice chunking their words!